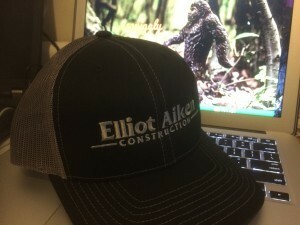 We’re excited to show off our latest project for Elliot Aiken Construction. Elliot asked us to give them a sweet looking hat that wouldn’t show any sweat stains after a hard day’s work. We delivered! These Richardson caps really are the best trucker style hat we’ve come across. With the charcoal front with heather gray mesh in the back, this hat not only shows off the coolness factor, but is a great product for showing off their brand. Hats are a great way to give your employees a consistent look that represents your business while they are out on the job. They also are great for giving to your suppliers or most valued customers to spread your brand awareness. Keep this in mind when ordering project quantities. The more your brand is out there, the more people recognize your business presence. Are you looking for apparel solutions to show off your brand? Contact us today for your next apparel project.